A story best told at speed. After finals, more exams, then the call to the Bar, pupillage, a lucky invitation to prestigious chambers, some early success defending hopeless cases – how sensible it had seemed, to delay a child until her early thirties. And when those years came, they brought complex worthwhile cases, more success . Jack was also hesitant, arguing for holding back another year or two. Mid thirties then, when he was teaching in Pittsburgh and she worked a fourteen-hour day, drifting deeper into family law as the idea of her own family receded, despite the visits of nephews and nieces. In the following years, the first rumours that she might be elected precociously to the bench and required to be on circuit. But the call didn’t come, not yet. And in her forties, there sprang up anxieties about elderly gravids and autism. Soon after, more young visitors to Gray’s Inn Square, noisy demanding great-nephews, great-nieces, reminded her how hard it would be to squeeze an infant into her kind of life. Then rueful thoughts of adoption, some tentative enquiries – and throughout the accelerating years that followed , occasional agonies of doubt, firm late-night decisions concerning surrogate mothers undone in the early-morning rush to work. And when at last, at nine thirty one morning at the Royal Courts of Justice , she was sworn in by the Lord Chief Justice and took her oath of allegiance and her Judicial Oath before two hundred of her bewigged colleagues , and she stood proudly before them in her robes, the subject of a witty speech, she knew the game was up, she belonged to the law as some women had once been brides of Christ. observations: Ian McEwan's books are full of over-privileged people studying their own reactions to this and that. In this book a description of London in the rain is mixed with looking at climate change. We are asked to consider several musical performances – obviously we can’t hear, so we have to take his word for it that one of them really is that cliché of someone performing spectacularly well because they are going through an emotional trauma. I found the music descriptions embarrassingly over-earnest, even though I share his taste for a quite obscure Keith Jarrett album (possibly our favourite track from it is different: I couldn’t quite tell). The issues are important, and McEwan is plainly intelligent, and not in any doubt about his intelligence, but I’m not sure a novel is the way to look at those issues. The book bears a strange resemblance to the James Joyce short story The Dead: a traditional Irish song is important, and a young man in poor health travels in the rain and gets wet in his devotion to someone, surely to his own detriment. 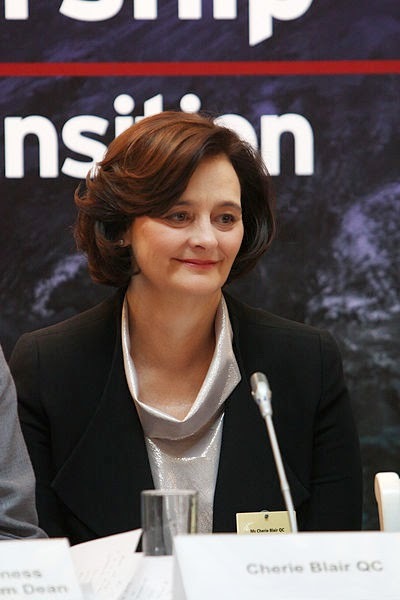 The picture shows Cherie Booth Blair, wife of the former UK Prime Minister and a barrister, QC and part-time judge. Depressingly, when I was searching for pictures using the tags woman + judge, a lot of pictures of beauty contests popped up. Other McEwan books, A child in Time and Sweet Tooth, have appeared on the blog. I tried to read a book by McEwan, but it didn't resonate with me. I didn't like the characters so I stopped reading. Also, it seemed a bit pretentious. I agree with your comments about overprivileged people. I saw him on TV recently, and I wasn't sure whom he was speaking about, didn't seem to connect, not with me, anyway. That's too bad about women and judges. Is that just in Britain? There are quite a few here -- three on the Supreme Court, several in local courts -- and then there are the TV judges, mostly women. Oh there are loads of women judges here, Kathy - and I am very proud of the fact that one of my schoolfriends is a judge. It's just that the google search threw up other images - many of them from the USA! I have liked some of McEwan's books (Atonement and Enduring Love) and I think he is intelligent and writes very well and clearly - but I just never warm to him. Which is similar to what you are saying isn't it? I'll probably settle for reading the ones I have already.....Atonement, Enduring Love, possibly Chesil Beach. Hmm.....CB-B and your schoolfriend judge aren't one and the same are they? I mean you're both "scallies" aren't you? Haha - what exalted circles you move in. Now I'm laughing even more! No, though you're absolutely right, could have been: both from Liverpool, both RC, and actually she went to a sister school of my school. However she is older than me! My schoolfriend leads a quieter life but is very much a high-flyer. That said, I do give credit to McEwan for addressing really important topics. Wasn't the issue with the sick child whom the parents spirited out of the country that the British health service wouldn't agree to cover the experimental treatment the parents sought? And they found another country which would provide it? But I believe the British health service relented. Is this so? About religious rights to refuse treatment, I know of a true story a retired midwife friend told me. A sister midwife had a patient who needed a blood transfusion during childbirth. She refused,due to her religious reasons and she died. The baby didn't survive either. However, there are more issues here, too. The woman had young children at home who needed their mother. And the midwife was so upset by the tragedy that she, a wonderful medical professional, quit midwifery. So, these issues, even involving adults, are not simple. An adult has free will presumably, although doctors have a way of making their test and treatment methods carried out. But someone has children dependent on her. Don't they have rights, too? Over here, parents have been jailed for not getting treatment for a sick child who then died. Sometimes it's for religious reasons; sometimes it's ignorance or fear of the medical system. The case here was a very complex one Kathy: the issues were not straightforward, and sadly there was a breakdown of communication, the case was not handled well I think. As you say, these are very difficult areas, and it is very much a philosophical question as to how far your own decisions have an impact on others.... No easy answers. I have not read Ian McEwan and what I have read here doesn't encourage me to do that. Which is fine because I need no more books or authors. I liked the statement that his "books are full of over-privileged people studying their own reactions...". I do a lot of that... studying my own reactions, but I am definitely not over-privileged. Just over-think things. Tracy, I once saw a book called 'Women Who Think Too Much', and I thought that was me. So I don't want to read too much about other people who over-think things.